Steve Woollard, director of NeuroRehab Allied Health Network, and Angela Rowe, neurological physiotherapist and postural management specialist, have developed a range of support aides for bed positioning and seating. Together they formed Postural Innovations, offering unique solutions for 24 hour postural management. Postural Innovations provide postural assessment, customised manufacture of positioning aides and recommendations for bed positioning and seating. We are a specialist provider of positioning devices which are specifically designed to help restore symmetry, reduce secondary complications and optimise function. We provide free, no obligation on-site assessments within metropolitan Melbourne to assist in prescribing the most appropriate device for an individual’s needs. Australia wide distribution is available and we are happy to provide guidance through correspondence. Positions adopted in bed or wheelchairs can be potentially harmful and cause further disability. Postural management aims to optimise an individual’s position over a 24 hour period. • Assist sleep and manage fatigue. Postural management through the use of positioning aides is not a one-size-fits-all situation. An individual assessment should be completed to ensure the right shape and size of device is used. Incorrectly fitted devices could lead to personal injury or worsening of posture. Postural Innovations have developed a full range of devices and sizes to ensure the best possible fit. Postural Innovations prescribe, manufacture and supply high quality postural support devices in a range of sizes. We have an off-the-shelf range and custom make items to meet individual needs. Please contact us for assistance with correct size application. For individuals who have a tendency to cross their legs (hip adduction). For individuals whose legs tend to move toward one side (wind sweeping). 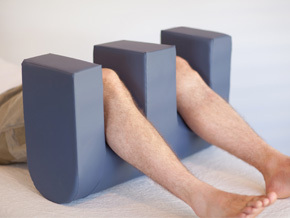 For individuals whose legs tend to move out to the side or require greater support. Curved supports can assist scoliosis management in lying and sitting and also assist lower limb positioning. The curved supports have a non-slip base which keeps them in place once weight is exerted upon them. We have a range of sizes and widths. For individuals who require support, stability or lower limb pressure care in side lying. Our side lying support wedges can be used to achieve both full and 30 degree side lying positions. Our side lying wedges come with a non-slip base to hold them in place. Issues such as respiratory management, scoliosis and pressure care can be effectively managed through a supported side lying position. The wedges are frequently used in conjunction with some of our other devices to provide optimum positioning. All Postural Innovations branded products are made from the highest quality foams covered in a multi-directional stretch, breathable, waterproof polyurethane fabric. For optimum hygiene and infection control, products are finished with heat sealed seams (no stitching) to ensure they are impermeable to body fluids. This also enables them to be easily cleaned with warm soapy water as required. Postural Innovations products are proudly Australian made. We also provide high quality latex support pillows. These come in three different profiles and can be used successfully with Postural Innovations devices to assist with head positioning. We also provide a range of small cushions. To enquire about Postural Innovations products and services or to arrange a free consultation within metro Melbourne, please complete the contact form, providing information on the particular issue you are trying to address. Thank you for contacting Postural Innovations. We will be in touch shortly to respond to your enquiry.